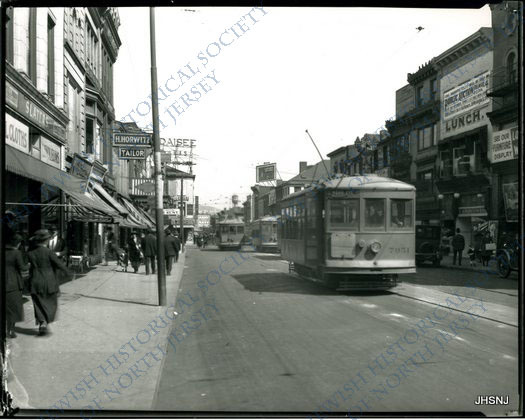 “Clang, clang, clang” went the trolley / “Ding, ding, ding” went the bell / “Zing, zing, zing” went my heartstrings……”Trolley cars on Main Street, Paterson, looking north. Notice Slater’s and H. Horwitz among the other merchants of long ago. Circa 1920’s. 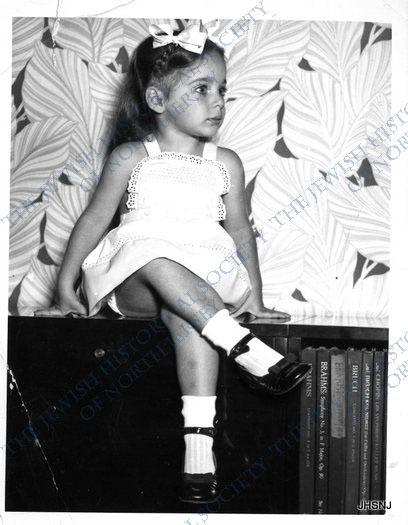 “Dance, ballerina, dance…..And do your pirouette in rhythm with your achin’ heart…” Found in the collection of Esther and Sam Schwartz. Date unknown. Who is this little musical genius? Donald Tribucher, date unknown. Could be the Gerber baby???? 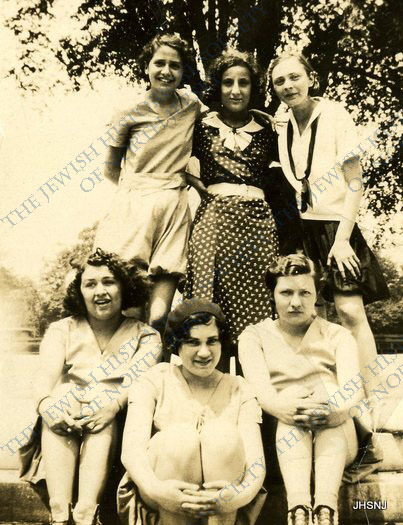 This very “retro” photo was found in our Passaic Archives. 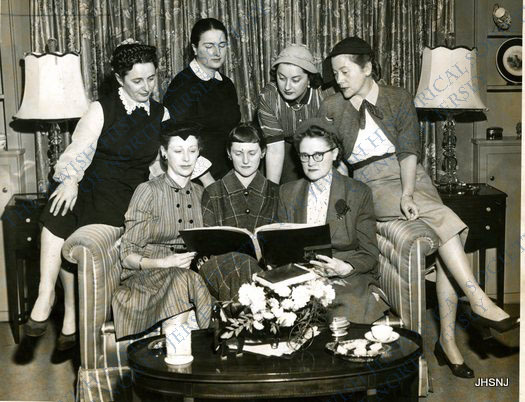 Marked on the back is “Society: Sale for Blind”….does any one know who these lovely dressed women are? 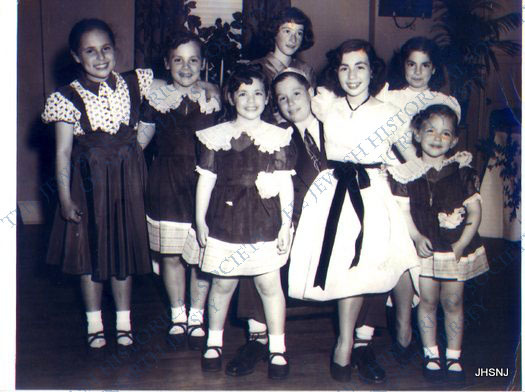 The Bar Mitzvah of Marvin Kushner circa 1951…..First row l-r: Susan Kolitch, Marvin Kushner, Arlene Weiss and little Carol Ann Rosenberg…..second row l-r: Maxine Weiss, Barbara Kolitch, the tall Marsha Seidel and Ellen(?) Gooter in the white dress. 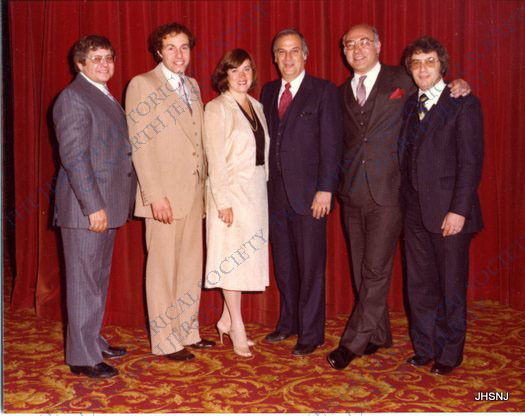 1980…L-r: Alan Lubnick, Stan Harelick, Natalie Tender Klein, Marvin Klein, Mort Shapiro and Ed Marcus. They are celebrating the 1955 Eastside High School 25th reunion. 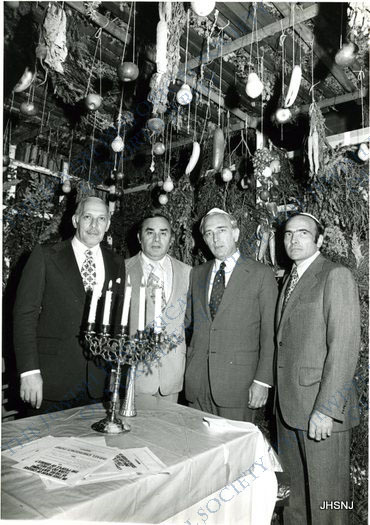 Bonus Photo #2: UJA Patersonians line up for their photo op…..l-r: ?., ?., Mitch Zalon, Sam Namkin, ?., Rabbi Meyer Greenberg, Charlie Kessler, Fred Lafer, ?., ?., ?., Gerrard Berman and ?. 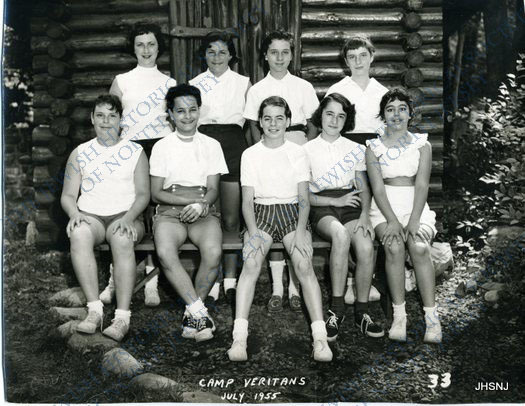 Camp Veritans girls bunk, 1955…..seated l-r: ?., Mireille Lipsitz, Eleanor Slaten, Sonia Nussbaum and Linda Belifonte…..standing: l-r: ?., ?., Marilyn Potash and Marilyn Gelman. 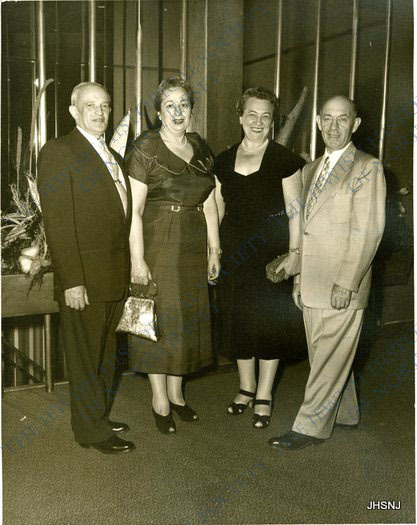 A collage of interesting faces from the past…..from top left clockwise are Helen Singer, Mystery Man, Max Grunes ca. 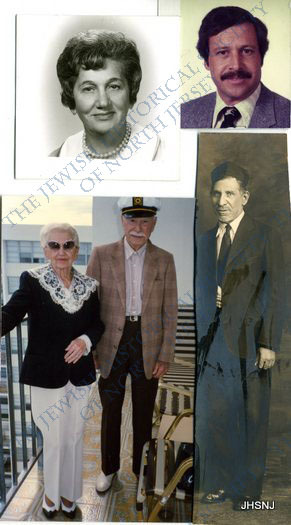 1920 and former Patersonians Sophie Kitay Greenberg and David Greenberg on the balcony of their Collins Avenue, Miami Beach, Florida balcony in March, 1989. 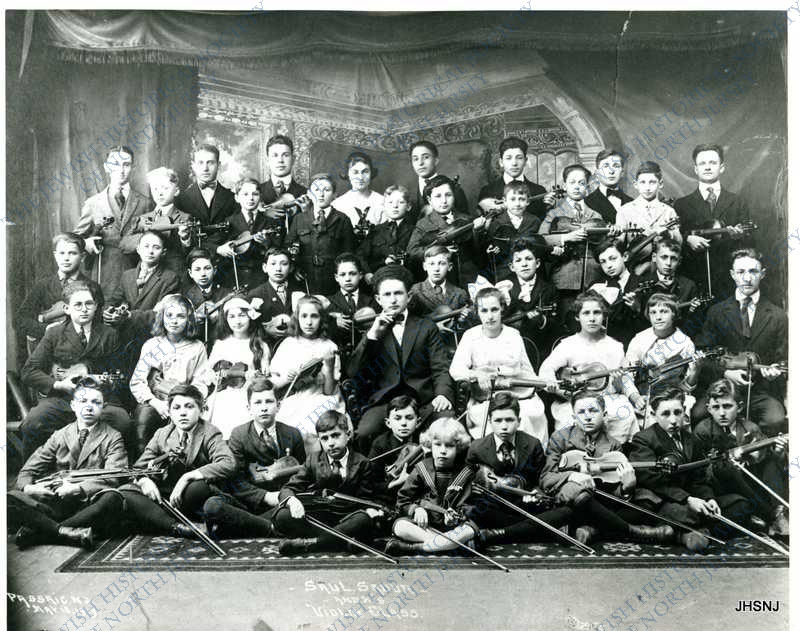 Passaic 1919…..Violin Group…..Seated on floor l-r: ?., ?., Irving Rinzler, ?., Joe Rinzler, —– Wolmath, ?., ?., ?. 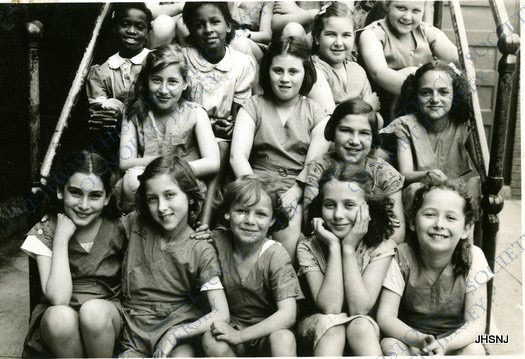 and Harold Kulwitz…..second row l-r: Saul Danowitz, Ceil Kaplan, Ida Belshin, ?., Saul Sodar (teacher), Lullu Joseph, ?., ?. 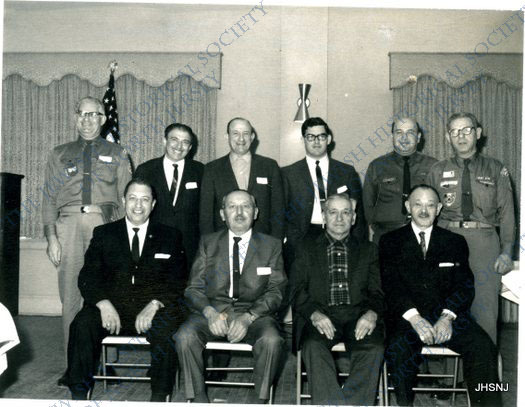 and ?…..third row l-r: ?., Max Brotman, Hy Bllitzer, Robert Levine, Sol Peres, Willie Ehrenfeld, Ben Schutzman, Lou (Like) Gruber and Henry Lindenfeld…..fourth row l-r: Sol goldberg, David Freidbauer, Harry (Heshey) Edelman, ?.,Phil Blacker, Caspen Chait, Melvin Simon and —–Kaplan…..top row l-r: (Dr.) Milton Gero, (Dr.) Al Reit, Robert Asher, Lillian Stahl, ?., Ruben Simbol, ?., and ?. 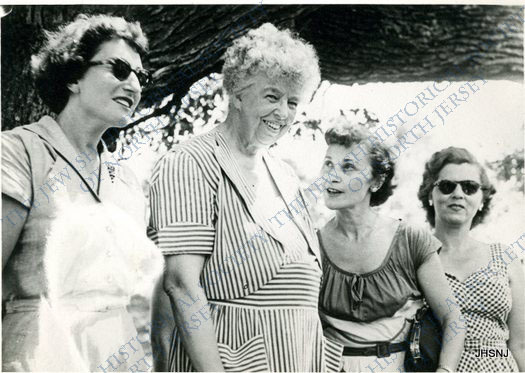 The National Council of Jewish Women visit Eleanor Roosevelt at Hyde Park when meeting with students. Date unknown. 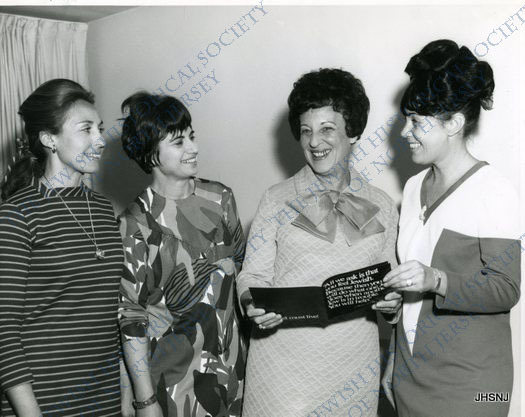 L-r: Flo Friedenrich, Mrs. Roosevelt, Rose Izenberg and Yetta Ontell. The geraniums are ready to bloom for the garden crew of the Golden Age Club. 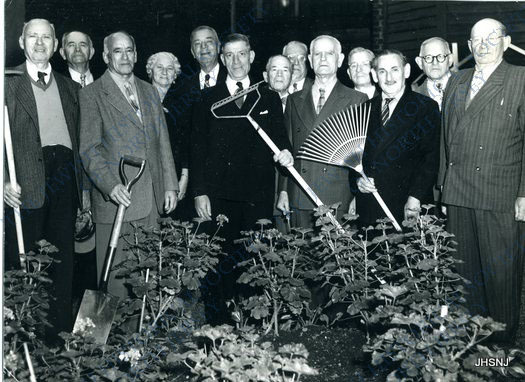 The only one sporting a smile is the lone woman a midst these stern looking men wielding their shovels and rakes in this 1954 photo. 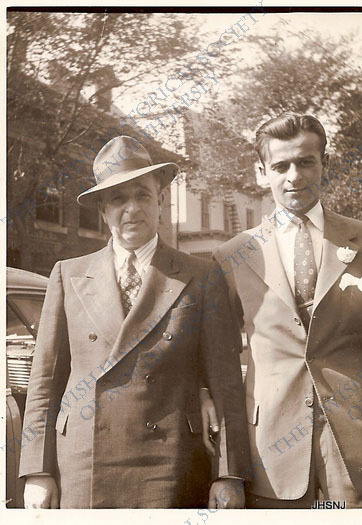 Why did everyone back then look so formal? Who are these men who are gardening in their suits and ties? 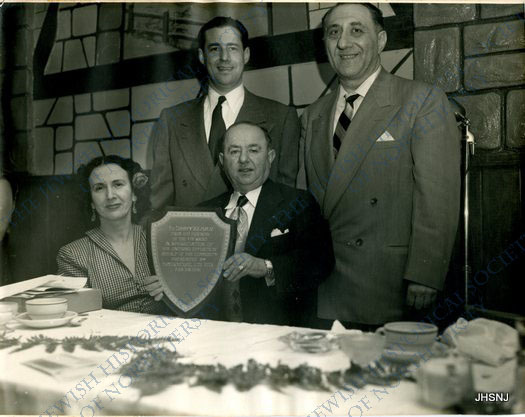 Plaque dedicated to: “Jimmy Klivan, From his friends of the Fourth Ward……from Mayor Michael De Vita, February 28, 1951.” …Standing l-r: “Chuck” Joelson and Joseph Masiello…..seated l-r: Winnie Rothstein and James Klivan. 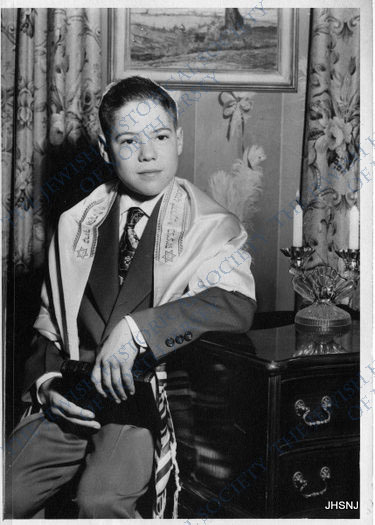 Henry Linn on his Bar Mitzvah day. Date unknown. 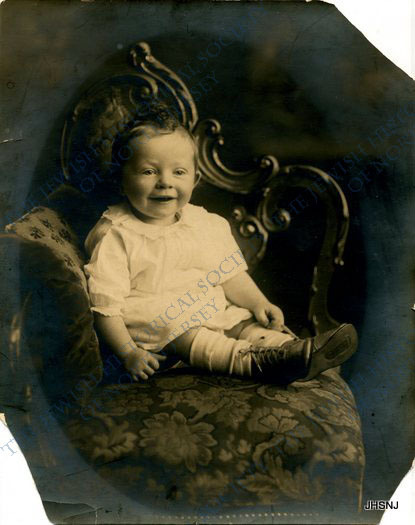 Found in our Paterson collection.